For over 2 decades, many kitchens are setting up their solid surface countertops. And this type of countertops won’t ever get outdated. There are newer versions of countertops available but they have many disadvantages as compared to having one solid surface especially for bakers as they could use the surface for mixing their breads or designing on fondant. There are no broken surfaces or grout lines and they are also not expensive and would last for years. 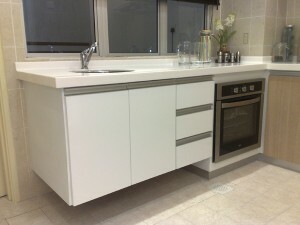 With the solid surface countertops they are made of 33% resin and the rest is made up of minerals. If compared to the quartz countertops they are made of only 7% resin and 93% minerals. As for the laminate surface countertops, they’ve been around since the 60’s. They can come in different designs and colors which is great to modernize your kitchen but this type of surface countertops can’t really last long. If hot pans are placed on top of it, the laminate burns. It also chips quite easily and you’d need to have them replaced. Solid Surface countertops come with different brands. Amongst the most popular brands you can find are Silestone, Corian, Shirestone, Gibralter, Avonite, Staron, Earthstone and Mystera. They also come in different qualities that you’d want for your countertops. It is non-porous as you wouldn’t want any bacteria growth on your countertop. They are also quite strong and can resist impact more than what a laminate can resist. This is because the plastic used is not just as a laminate or cover of what’s in between but it sees its way through from the bottom to the top portion of the countertop. If scratches would occur you don’t need to change your countertop. Just use a sand paper and sand it out. You can even choose from a selection of colors and designs. For those who want to install their own solid surface countertops at home, this is one of its downside as it’s very difficult to have it done by a non-expert. You’d need an expert to have it installed. A small price you have to pay in order to get the countertop that will last for many years and won’t give you a lot of problems. They don’t need a lot of maintenance from you. Just clean it up regularly and it’s ready for another day of a busy kitchen. Even if you leave it with stains on top of it you won’t have to worry about bacterial growth that will seep into the countertop. Just clean it up nicely and you can use it once again for flattening your bread dough or whatever baked goodies you have without the fear of bacteria or fungus on your food. If planning on remodeling your kitchen and still wondering what countertop is best, consider choosing the solid surface countertops. You’d be surprised at the number of designs they have available. Consider its pros and cons and compare it to other surface types like the laminate or granite.